1967 | Gary Brooker: vocals and piano | Matthew Fisher: Hammond M-102 organ | David Knights: bass | Ray Royer: guitar | Bill Eyden: drums. yes, once upon a time, music was poetry. Haha I was looking for the name of this song because the church pipe organ was so haunting. The only words I knew of it are “Trip the light fandago, turning cartwheels in the sand.” hahaha. Now I know better. :) Merci. Hello, since a long time, I am a great fan of what I think is the Best British group – Procol Harum. I research all the lives shows , particulary in Holland, Germany, Scandinavienlands, USA, Great-Britain, etc.. and also the live show of Procol Harum in Boston, 2010-06-15 and the show of Gary Brooker’s Ballet called Delta video 1990. any archival records anywhere? 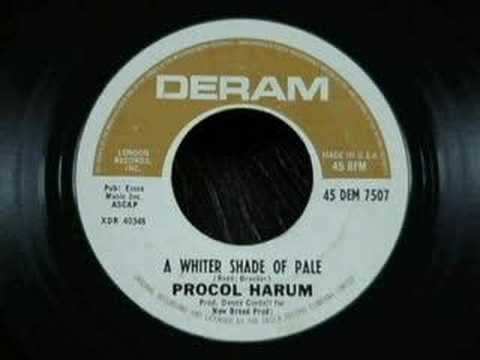 Was Procol Harum a 1 hit wonder? anyone? One interpretation reads that the song held odd and unrelated lyrics, possibly from a poem by Reid about boy/girl relationships that used sailing metaphors, which were a pun on or spoof of the psychedelic songs written at the time which had bizarre metaphors and droll phrases. Another line of thought. I really like the melodic refrain of this one – the leitmotof or watever. Where can one find the extended version? This was my anthem many years back! Listening to it after ages. Thanks for bringing back memories.